The Acronis True Image 2015 DVD, 2016 (burned from an ISO provided by Acronis support), & one created from a installed 2015 do not work. The boot to the first menu screen & I can select & I can select Acronis True Image 2015(2016), then it goes to the big splash screen that has Acronis True Image in huge letters with a listing of patent numbers, then after a little while it goes to a dark screen with Acronis loading please wait… in the upper left had corner, then nothing. A blank screen. The monitor is still getting a signal but nothing. It will not get that main menu screen that I can attempt the restore I need to do. I've attempted various fixes, EFI, no-EFI, Auto & SATA, IDE, RAID (which I am using). OK so it appears I am the only person to ever have this issue. My Windows 7 Pro DVD boots up just fine but anything made by Acronis will not. Very strange & it makes me sad that I am going to have to reload Windows, get all of Windows updates (a effin chore seeing how Windows Update seems to be hosed now), load all those programs & all. Good thing I actually am not losing data, I backed that up manually before I started this project. Maybe someone can recommend a solution other than Acronis that actually works. Support has given me several downloads of ISOs & asked for things that can't be given without a Windows build already on the machine, & nothing has worked. The Windows 7 DVD boots, Unbutu boots up just fine, Knopix no problem. Anything that has Acronis on it does not. The Acronis boot disks work up till I select any of the options, like Acronis True Image 2016, it ends up just showing a blank screen. Is there really no solution? I have a 3 machine license, it would be nice to get the license that I used on this machine back seeing how Acronis just does not work with this motherboard. For completely unknown reasons. 4. Click OK and select Acronis True Image option. Does Acronis True Image boot in this case? Yes, I've tried the acpi=off and noapic & also just blanking out the quiet. Support emails have suggested these fixes. It still just ends up at the blank screen. Right now the latest suggestion is for me to flash the BIOS. Once I get the time to try that I will. This past weekend I went ahead & flashed the BIOS. However, this was just to see if the Acronis software on the Acronis boot disk would work. After a couple weeks of struggling trying to get Acronis to recover this machine I gave up. This couldn't wait forever, so I have to load a new build of Windows, reload all my software, & restore my data (that I had backed up manually). This was time consuming which is why I bought Acronis to avoid. Yes, after flashing the BIOS the Acronis software finally loaded. However, I have no reason to risk restoring what I've already built. If it fails I would be back at square one. 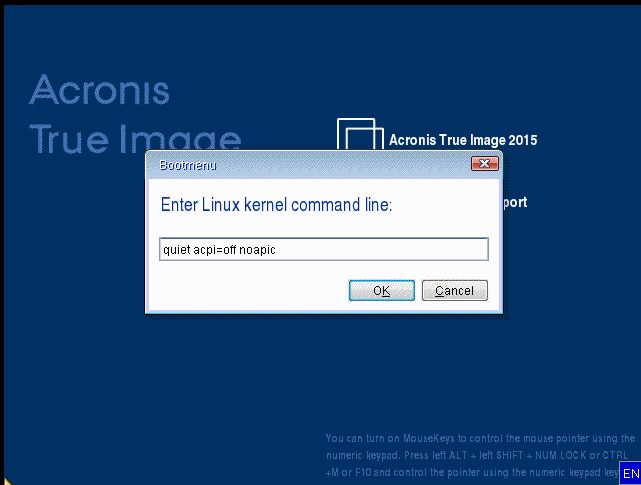 Unfortunately I wasted one of the three installations allowed with my purchase of Acronis True Image 2015. I'm hoping support will provide me with a replacement key. You can always install the and activate the software on the different machine. Please follow instructions from this article to move activation to another machine. I have a similar problem. I can boot from my DVD and Acronis boots and lets me select Acronis True Image 2015, then the screen says Acronis Loading Please Wait. And it sits there like it is not recognizing the drive. It is an SSD. Strang problem on the computer, the vendor website says it is a SATA disk controller, the Device Manage says it is SCSI ?? Did a Win 7 Enterprise complete install and all Windows updates and the driver changed from SCSI to SATA ?? Tried Acronis again, still not working, same thing, Not Loading Please Wait. Also contacted vendor--still waiting on a reply to see if it may be a computer problem. David, if you are attempting to boot from an Acronis boot CD and it does not fully load or recognise your system hardware, then I suspect that you are using the standard linux based boot CD and this in turn does not recognise the hardware in your Windows 7 system. You will need to create the Windows PE version of the Acronis bootable rescue media using the provided Acronis Tools option for the Rescue Media Builder, this in turn will require you to download and install the Microsoft Windows ADK or WAIK software to provide the Windows PE software that is needed. I am assuming that you are able to use ATIH 2015 from within Windows 7 without any issues and can create backup images OK? You may also want to make sure that you're booting into the correct version of the offline recovery media. If your system is a Legacy/MBR OS install, you want to make sure you're booting the Acronis media in Legacy/MBR mode too (colorful menu choices to start with). If your OS is UEFI/GP OS install, you want UEFI boot mode for the recovery media (black screen with white text for the initial menu). Also, I've had trouble with bootable media hanging when the system bios SATA mode is set to RAID instead of AHCI due to the RAID setting having a 500Mb limit for the RamDisk size that Acronis may surpass. A temporary work-a-round could be to change your SATA mode to AHCI (if it is indeed RAID in the bios) ,simply for the purpose of booting into the media as that removes the bios limitation of a 500Mb Ramdisk. Your OS won't boot if you forget to change it back, but this won't actually impact your OS - just allow the ramdisk to be created if that is the problem. Also, wouldnt' hurt to recreate the booable media - just in case. I typcially use USB flash drives and let ACronis build them from witin the application instead of using CD's (if possible). The simple answer is a BIOS upgrade. That is after you've attempted all the fixes they post here. I tried them all & more, more given by Acronis support. blah My hardware is not new & is a very popular chipset. I really don't understand why Acronis failed me so badly. Acronis support did work with me so I can’t fault them. The solution that worked was to flash my BIOS with some UEFI BIOS from Gigabyte (my MB maker). That was not at all fun as I've never had a BIOS update that gave me any problems. This one caused all sorts of driver issues in my Windows 7 build. Pretty much a nightmare. I got through them all & yea the Acronis boot disk worked. However, I never actually attempted to restore my back-up because I already had a working build. God knows what would happen if I tried to restore my old build with that new BIOS. After years of using Acronis & recommending it to everyone, I am done with it. What was an excellent product that was easy to use but those days appear to be over. Maybe version 2017!? I can only speculate, but sorry you had to go through that. I'm not sure of the logic for having to flash your bios to someting else unless it was a vendor provided OS for your specific board or how a bios upgrade impacted drivers in Windows. Always good to have the most current bios version though as they are usually manufacturer bug fixes and enhancements for the hardware. In that case if the bios flash failed your machine, that's a mobo/bios issue, not Acronis fault. My best guess is that after the bios update, it reset the settings in the bios and they would need to be set the same way for the OS to function properly. Some older machines are strictly Legacy/CMS/Bios aware. However, a few motherboard manufactureres have released newer bios revisions that brings in UEFI/GPT capability. If that occured in your case, it may have defaulted to wanting to USE GPT instead of MBR/Legacy and/or automatically switched the SATA mode from ATA, AHCI or RAID to one of those 3 that was somethind different than what was originally set - that would trigger the need for some additional drivers in Windows (https://support.microsoft.com/en-us/kb/922976). I've used ATIH for several years and as long as the bios was properly configured, have never had an issue with booting recovery media and new and old systems alike - the key is to make sure bios settings allow for booting of the media though and must be configured correctly. 2a) If your bios is UEFI/GPT, you need to boot your bootable media in UEFI mode as well. 4) I would avoid CDs/DVD's if possible. Write jobs are not always successful - especially if using cheap discs. These can also get scratched up and/or just break down over time - I had several burned DVD's of movies that had only lived in a case for 2 years. Only about 10% of them still worked despite never being touched that entire time (and they all orginally worked after first being burned). 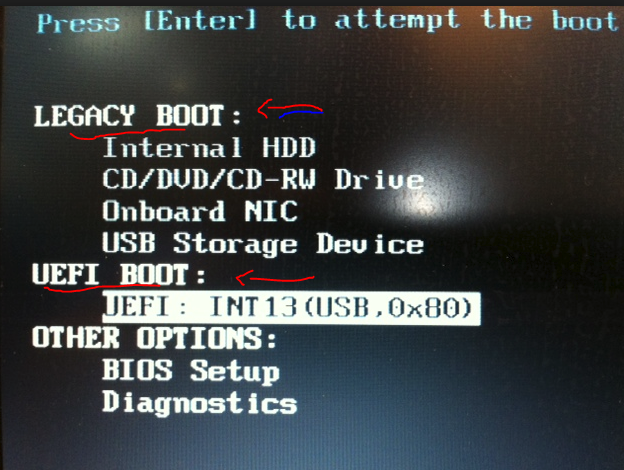 5) If your system supports UEFI/GPT and Legacy/MBR booting - you may still have to verify that USB booting of legacy devices is enabled in the bios - this is often an additional setting but varies from bios to bios. First off, thank you for for your reply. As I remember, I tried all those things you list & then some. I worked with Acronis support for quite some time. They are the people that told me to flash my BIOS. The logic came from Acronis Support, that was the final suggested fix to resolve my issue. The BIOS came from the MB manufacture of course. IMO it's not always good to flash to the lastest BIOS unless you have a specific reason for doing it. Such as but not limited too new CPU support, overclocking support, specific componant issue, new OS version, security issue, etc... Flashing the BIOS is risky. In this case the flash went well. However, for the first time in my experience, it caused Windows to see several things as "new". As I remember, it was things like the PCI bus, the USB bus, & some other stuff. I had to locate the correct drivers for each & re-install the componants. The BIOS came with a completly new UI with mouse support & I had a few stuggles just to get it to boot properly. Yes, finally the Acronis boot media worked, but I had no desire to take it further & attempt to restore my previous build. Not with the new BIOS & the fact that by this time I had completly reloaded everything. David (the new guy in this thread) posted about his problem which is similar to mine. I got a message the thread got bumped so I thought I should come & post what my fix was. I used that same post to express my disappointment with the latest versions of Acronis, a product I've used for a very long time. I hope David has better luck than myself. Thanks Joe. It sounds like the bios flash was a major revision for your system bringing it from Legacy/BIOS only to UEFI/GPT capability. Unfortunately, that could very well require new Windows Drivers to support the newer technology. Sorry you had to compound the issues of the drivers and the recovery, but I do think your bios update was a fairly unique situation since it was such big bios upgrade that brought GPT/UEFI support to the existing hardware. You're right about BIOS flash being risky - there's always the possibility something could go wrong and then you'd not having a working motherboard. The biggest risk is usually power loss during a bios flash. Most modern motherboards have protection for these issues though (dual bios / Qflash / special hidden bios that can be reset with jumbers or a flash tool, etc). I work in an IT office with roughly 800 active PC's (not to mention the hundreds we refresh each year) and we are constantly updating the bios on our systems (Dell puts out a new BIOS quite often). I can say that in all of the BIOS updates I have completed, not one has gone wrong - maybe I'm just lucky, but I don't think it's nearly as risky as it once was - especially if you have battery backup during the procedss. After upgrading the BIOS, we usually see better performance/capabilities as the updates tend to address issues from the previous versions so I don't hesitate to update anymore - I actually look forward to them on my home systems to see what new capabilities, features and bug fixes it actually comes with. That's just me though, but completely understand your concerns. Was it the overall process that has turned you off of Acronis, or just a distaste for Acronis in general? The bios update, although a suggested resolution, is completely out of the Acronis backup/recovery process (other than brining the capability of your sytem to be able to use bootable media more effectively). That aside, it does sound like the backup and recovery process did turn out successful. I don't suspect that any major bios upgrades will have this impact on you in the future, but hopefully, you won't have to find out either! Thanks for sharing. I'm sure your experience will be useful to someone else too! I did the WinPE creation on a USB flashdrive and it worked fine. I wanted to add a suggestion that fixed my problem with the boot media not loading - I run an ASUS Maximus VIII Hero Alpha board with an Intel Skylake 6700K processor. In order to get the boot media to work properly, I must disable Windows Boot Manager as a boot device in my motherboard's BIOS (a full disable, not just an adjustment of boot priorities). Once I do this, I run Acronis Boot Media to reload my image on to my NvME Samsung 960 Pro 512GB boot drive, reboot, go into the BIOS to re-enable Windows Boot Manager, and then I'm off to the races. I have Acronis True Image on my laptop and I cloned my HDD to a SSD with no problems but then I created a bootable media (usb and cd/dvd), to try get a backup from my desktop (no ATI installed on that computer), the media boots fine but when I click on "Acronis True Image" its follow with the blue screen that has all the patents information, then "loading please wait" screen, it goes to the blue screen with the mouse cursor in the middle (nothing else on the screen besides two buttons in the lower right corner, a "ES" button and a monitor like button or something) and the keyboard and mouse stop working (the cursor doesn't move). What is causing this problem? or is it that I need a license for that machine too?....thought I could use the bootable media to backup/restore more PCs than just the one in which it was created on. You should be able to use the bootable rescue media on more than one computer but it is important that you boot it in the same way that the installed Windows OS on that computer uses. See webpage: Check if your PC uses UEFI or BIOS then pick the correct boot option that matches your Windows mode. Both are BIOS, The media does boot, the problem occurs when after the black screen "Loading please wait", you know when the application should starts it doesn't and instead I just get a blue screen with a stuck mouse and keyboard. I tried the same bootable media in another PC and it works just fine so Im wondering what can be causing this problem, any ideas? If its of any help, the PC with this problem is very old, so maybe a compatibility issue? The other check-point here is to look at the minimum system requirements for the version of ATI that you have used to create the rescue media and ensure that you can meet those requirements with the old PC? You can find the user guides for other versions of ATI via the Acronis Links link in my signature below. I join this thread to add my experience and solution. I installed a new motherboard with CPU (Intel 7th gen) and memory. This moved my system from Legacy bios to UEFI. I had True Image 2015 installed, that continued to work fine in Windows 10. However I discovered that the bootable recovery media would freeze at the selection of task screen (TI or Windows). It was the same for every media I created even the one downloaded from TI2015 support. My solution was to upgrade to TI 2018 and create a recovery media via Tools. This media has massive code (800MB) requiring the use of a DVD media. With so much code there is a long boot period but all works just fine ie an image can be recovered or created. The upgrade cost was not great and worthy avoiding any more struggle. I should add that before moving to the new hardware I used the new Windows 10 command mbr2gpt, to convert the SSD to the GPT that is required for a UEFI bios. This enabled Windows to boot immediately with the new hardware. ahh.. the hours wasted trying to get new ATI software versions to work like the previous ones did! I have experienced the same blue screen with a yellow mouse cursor in the middle and two icons bottom left corner. I tried many things including removing all usb peripherals and using a single screen and various bios settings; booting from usb and dvd boot media using Linux boot (as this has always been standard before) both from 2017 and 2018 ATI versions I previously purchased. I have not yet but am about to try creating Windows based dvd boot media with ATI 2018 - however I just used my older ATI 2014 boot media and hey presto - it loads. My thoughts now are can I trust this 2014 version to correctly clone my Win 7 ultimate boot ssd to a recent Crucial BX300 or should I use the ATI 2018 version ?, .. if I can get that to work. Some other details in my currently failed attempt to clone to a new ssd from a working system that does not have latest ATI installed within Win7.. I have a 2011 ASUS ROG Extreme main board with I think an original intel i7 with an EFI bios. In bios SATA was set to RAID but have since adjusted to AHCI as I have no intention of using RAID. "The file is possibly corrupt. The file header checksum does not match the computed checksum." No F8 option or anything like that. I googled but didn't find any direct match and from previous experience with updating linux and grub in a dual boot system this always required booting from a Windows DVD and selecting a repair option which I assumed basically re-wrote a disk signature. So I tried the Win7 DVD which duly started a repair but that did not behave as expected and seemed to lock up. After that I tried changing bios SATA setting to AHCI which resulted in Windows attempting to boot but failed to load at all...... at this point I gave up trying to recover anything as I still had the orginal ssd intact. Currently I have reset bios SATA to RAID, OCZ ssd booted fine as normal, I verified the registry setting HKEY_LOCAL_MACHINE\System\CurrentControlSet\Services\Msahci\Start is value "0", rebooted with bios SATA set as AHCI and still boots fine. May be a bug with the previous ATI 2018 version so I overwrote the usb boot media with a later version from build 10410 - which gave me the blue screen described in this forum post, as does DVD's from 2017 and 2018 but 2014 DVD does boot - Please any thoughts on should the ATI 2014 version clone work ok? And this time I am waiting for some PC 6gbs sata cables to arrive so I can attach the Crucial ssd direct inside the system case to eliminate any external USB interface issue. update - using ATI 2018 recovery boot media with the WinPE option works and allows the ATI menu to load correctly. From this I was able to create a tib image file of the Win7 boot ssd disk to an external USB portable drive. I am waiting to receive a sata cable to attach the new 480g ssd then try the clone option again. Another option would be to replace the existing ssd with the new one then boot with the WinPE recovery DVD and restore the image file from the portable USB drive. Interesting the older ATI 2014 boot media DVD loads ok but from this post it seems any later versions suffer the empty blue screen issue, maybe some uefi code?? Rick, one of the changes with ATI 2018 is to allow Cloning from within Windows without the need to restart the computer provided that the target drive is empty, this will then use the Microsoft VSS snapshot feature for making the clone. As with all Clone operations, please do not attempt to boot into Windows with both the original and the cloned drive attached as this can cause serious issues due to duplicate drive signatures.